Although the look of knotted wood is sometimes desired for a rustic piece of furniture or to bring authenticity to cottage design, knots can pose a problem when a polished, painted look is the goal. Knots in wood seem to be able to bleed through any paint you throw at them, but it is possible to cover the knots for good and stop them from bleeding through your paint job. Scrape and clean the wood with a paint scraper, rag and mineral spirits. Sometimes knots in wood can ooze sap and this needs to be cleaned before any primers or paints are applied. Fill any cracks or holes in the knots with stainable wood filler and a putty knife. Stainable wood filler can be found at hardware stores. Sand the wood with coarse-grit sandpaper, followed by fine-grit sandpaper. Remove all dust and debris with a tack cloth. 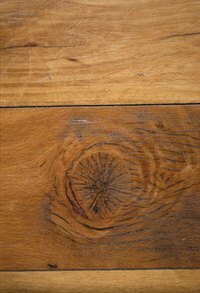 Apply two coats of a clear amber shellac or polyurethane using a wide paintbrush. Allow each coat to dry according to manufacturer's specifications. Apply one coat of white pigmented shellac using a wide paintbrush. This will prepare the piece of wood for the primer application. Allow the paint to dry according to the manufacturer's specifications printed on the packaging. Apply one coat of oil-based primer using a sponge roller and paint tray. Allow the primer to dry thoroughly. Follow with two coats of oil-based paint in the color of your choice. Allow the paint to dry. Always work in a well-ventilated area when using shellac and polyurethane to avoid inhaling any toxic fumes.